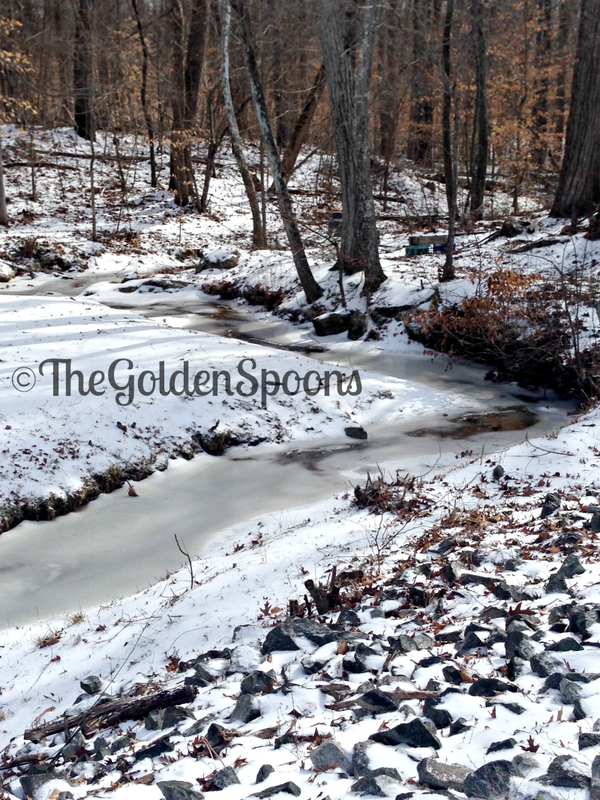 The Golden Spoons: Where is YOUR Paradise? When you hear the word "paradise," do you picture somewhere tropical and sunny?? Do you picture yourself lounging by the ocean with a fruity drink in your hand? Maybe you envision something like this . . . . However, this was my paradise today (Tuesday). I'm an oddball who like winter and, here in the South, it doesn't take much snow to cause a snow day. We had about half an inch of snow Monday night topped off by half an inch of sleet and that was enough for school to be cancelled. Warnings to be issued to "stay off the roads" and that's justwhat we did. My girls and I slept in and lounged in our pajamas until about 10:00. Then we went out and played in the snow/ice. We ran and laughed and had a blast. After that, we spent the afternoon with each of us doing the things we love most. My oldest daughter (12) spent hours on the couch with her tablet in hand furiously typing away on the novel she is writing. (Like mother, like daughter I suppose.) My two youngest daughters played together all afternoon. I sat with my computer typing this post and catching up on blog reading. The evening will have a slower pace as school has already been cancelled again for tomorrow. There will be lots of snuggle snap maybe even a movie night. This week, we will have some of the coldest temperatures our state has seen in years, but our pantry is stocked and our hearts are full. We are safe and warm. It may not be a tropical island with the sun beaming down on my face, but it is paradise to me and there really is no place I would rather be. Tell me, what does paradise mean to you?? 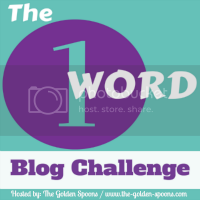 This post was part of the One Word Blog Challenge. This week's prompt choices were Paradise, Alone, and Regret. Next week will be the last week of the 8 week challenge. Lisa, head a bit north to NY and hang out here with me, you would be in 7th heaven as we have had quite a bit of snow and freezing weather. As for me, I am truly counting down the days to spring and much warmer weather now though. Ha! I would love to come visit & not just for the snow!! :-) Though, I will admit that when I have seen news stories about the blizzards in New York and Boston having a record amount of snow,I think to myself "That would be AWESOME!" I'm insane, I know. I chose the same word, Lisa - and once again, our thoughts about it were similar. :) Thank you for this glimpse into your Paradise. It definitely looks and sounds like a wonderfully happy place. Glad you're enjoying the snow and some downtime with your girls because of it. I just read Janine's comment, and I'm with her. I live in NY as well, and would love to send you some of our snow if you'd like it. How's a foot of it sound? I can easily spare it. I would have to choose warmer weather as my paradise. snow doesn't do it for me! Awesome list Lisa! Especially the cleaning one, because I have that one on my list too...although I did sneak in one similar e.g. not have to pick up after anyone! Just this morning, I woke up to a mess on the bench (it was clean last night)...how hard is it to put things away...really??!! Oh and yes to the shopping spree!! I am in need of a new wardrobe! 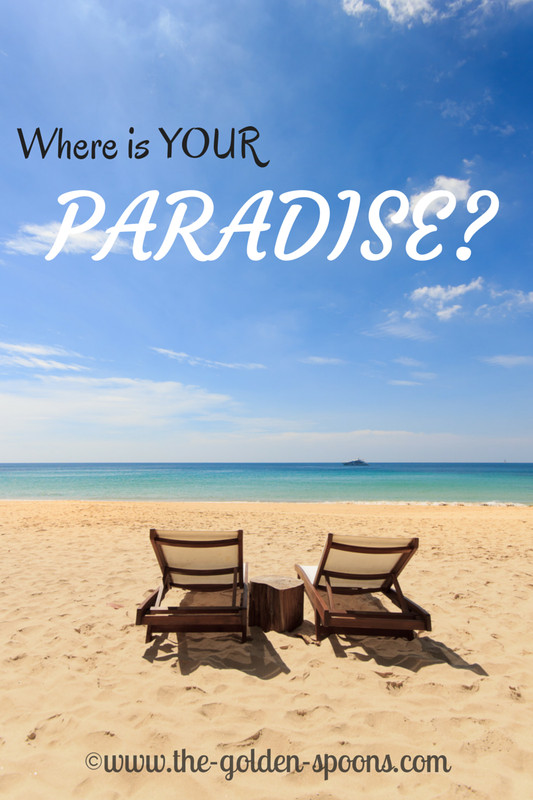 It can certainly be paradise, too and If I won a trip to a tropical island right now I would definitely take it! I love your whole list! I didn't think of homework because I so rarely have to deal with it, but that's a good one for sure! Paradise has to involve sunshine for me! And warm temps. I am done with winter and snow days!! Although I did go out for a bit yesterday with the kids. It was nice and sunny, even though it was cold and they enjoyed sledding down the driveway! Your list rocks, Lisa! I especially liked the ecard for wishing I was as skinny as I was when I thought I was fat. Ha! Here's to going viral and appearing on talk shows and getting lots of money! Yeah, I'm weird! :-) Glad you were able to enjoy it anyway yesterday! I am so with you on the cleaning. My kids cam in today from playing in the snow. I told them to put all their stuff in the washing machine - they dropped it all in the floor right in front of the washing machine. Really?!??! Is it that hard to just go ahead na put it IN?!?! Ugh! Homework makes me nuts, mostly because my kids whine about ti so much. If they would just do it and not complain, I wouldn't mind it. Cheers!!!! Yeah, I was just think the other day about the weight and size I wish I was and thought "You know, I was that size once and wasn't happy with it. What I wouldn't give to have it back now!!!" There are those days that just seems so perfect and oddly enough the day wasn't even planned. This sounds like one of those days! Snow here in Southern Az where I live is a big deal and becomes a thing of memories and magic when it does happen. Oops, my phone cut me off. But I also meant to say that 75° with a breeze is my idea of paradise! Paradise for me, is somewhere where I can go to lose myself (mentally, emotionally, spiritually)...a place where I have no worries, no obligations, a place where I am at peace with the world and my life. I would be close to a creek/stream and a waterfall, hidden away in the bush. I do have a place like this...it's where I go when I need to reflect and refresh my mind, body and soul! I also wrote about paradise, though I'm daydreaming of mine. It's been balmy in my neck of the PacNW this week, but we've not been able to make it to the beach. So I'm pretending while I sip my iced tea. I'm so happy to see you're enjoying the time with your girls and embracing the snow, when so many are not. What a refreshing read! It sounds like a lovely place - paradise for sure!